One thing you come to learn about Spain as an American living abroad, is that there is seemingly a holiday every single day. Half the time you will not know in advance and you will just casually pass a parade or something. Do not be alarmed, it is normal. This all comes to extreme heights at the end of March with the start of Semana Santa or Holy Week. These days of celebration are those that begin on Palm Sunday and last up until Easter Sunday. Each night there are processions through the streets. These processions last many hours and the same people walk the same path around the barrio tirelessly. The Rambla is cut off to traffic and seats are placed all around. Some of the people proceeding wear robes and hats, some hold palms, candles, etc and one group of about 22 men hold a large statue of either Jesus Christ or the Virgen Mary. As an American, at first seeing the parades is a little odd, especially the clothing. 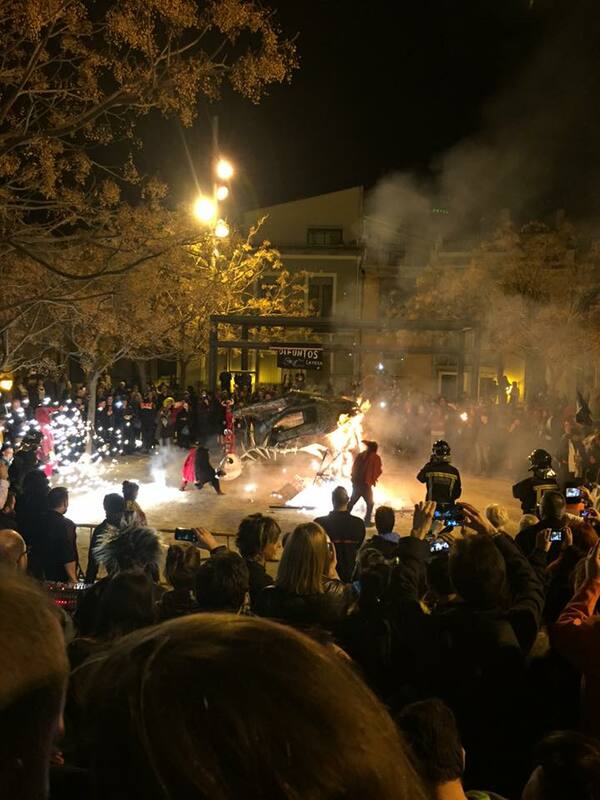 However, after watching the processions and learning from the people on the streets, it is incredible to watch the commitment and reverence for these events. I was able to watch 3 processions on three separate nights. They all were very incredible, but all very similar. I really respected the respect toward their religion and Jesus Christ and the Virgen Mary as they proceeded through the streets. It was a very interesting cultural experience. 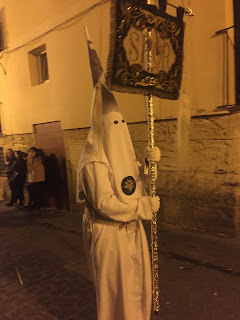 Immediately following Semana Santa I set off for spring break (but thats a different story). What better thing to welcome me back home to Alicante though than, yes, you guessed it, another holiday. This one was a little different as I was an active participant. This holiday was called Santa Faz. 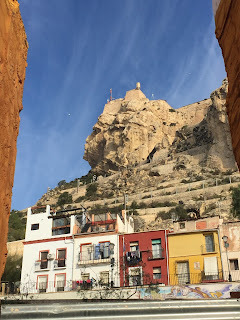 For this day, the people who want to, wake up bright and early (my host mom and I left at 7am) and walk over to the main church in Alicante's barrio. There we grab walking sticks and start our trek. 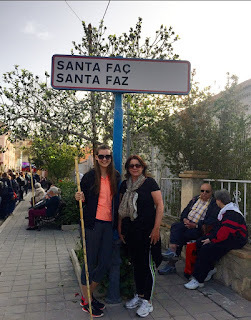 We walked about 7 kilometers (a little over 4 miles) to the pueblo Santa Faz where there is a church and street vendors. Some people, those who feel the need to repent something, do the walk barefooted. Many at this point in time wear sneakers but enter the church to pray and repent and give thanks when they arrive in Santa Faz. I felt very lucky to be able to do the walk with my host mom, practicing my Spanish and learning along the way. While we walked, I noticed many young people pushing shopping carts on their walk. 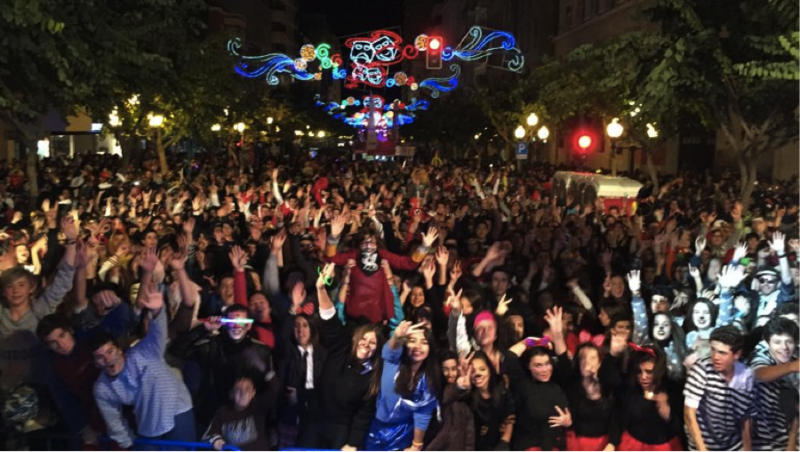 It turns out, over the years the holiday has become a little more about partying for the young people of Alicante than about anything else. Almost every group of teens had a shopping cart decorated and filled with booze and food and their personal belongings. 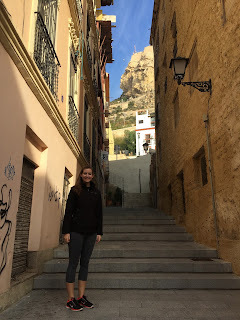 Luckily for me, I did the walk in the early morning with my host mom and was able to see the way the holiday was practiced more traditionally in Alicante. Afterward, I walked down the Playa San Juan, where they youth had congregated, and met up with my host sister Maria. There, I was able to experience the different side of life of this holiday, and see how the typical teenage Alicantinos spend Santa Faz. It was definitely interesting to see the contrast and experience the day as a whole. I would highly recommend participating in any and all events and holidays in your host city as possible. It is definitely where you learn the most, and feel the most a part of your city! Let me start by saying, I love to shop. I am not sure if you fully grasped my enthusiasm from that sentence, but I LOVE to shop. I will buy things I do not need all day everyday. However, another interesting fact about me is that I hate spending money. WHAT? How can both of those statements be true? Well, they are. This means that one of my strongest attributes is finding sales, clearance shelves and deals to get as much as possible for as little as possible. Its like a game to me(which is the best way to put it as I am am also super competitive). Anyway, so what does all of this have to do with Spain? 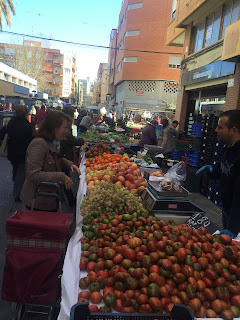 Well, in Alicante and many cities alike Saturday mornings host the Mercadillo. The Mercadillo is a large outside street market, similar to a flea market where you can find EVERYTHING. Literally, its all there. 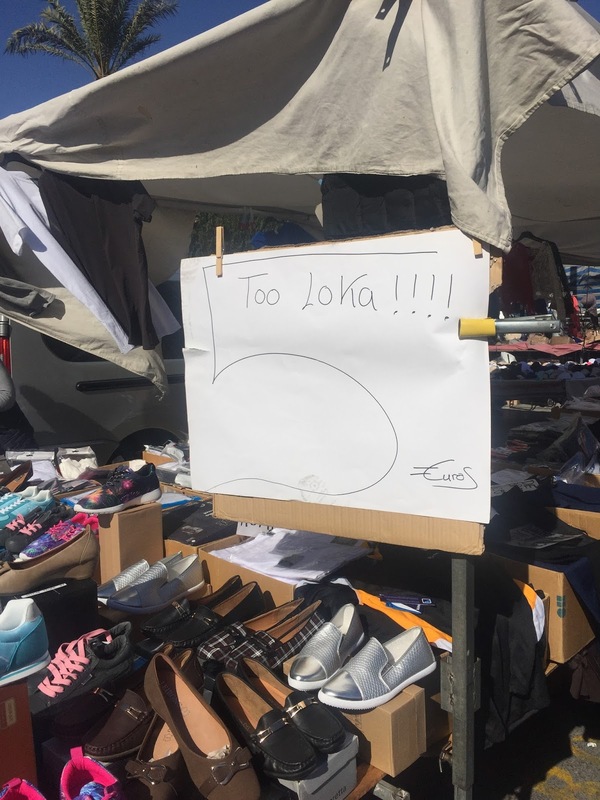 They have streets and streets of fresh fruit, vegetables, candy, snacks, socks, shoes, dresses, running clothes....you name it its there. As if that isn't exciting enough, the prices are unreal. It is so inexpensive I could cry. The last time my host mom and I decided to go to the Mercadillo was to buy oranges. We left with oranges, 4 scarves, 2 purses, one pair of leggings, 2 rugs, a full lunch, some vegetables, and finally, oranges. I have personally begun calling it the "Spanish target" as I have the same excited feel here as at Target, and also buy more things than necessary in both locations. It was one of the best experiences I have had here and have of course repeated the experience whenever possible. The mercadillo is flooded with all kinds of people out shopping for whatever they may need. The vendors are shouting out their deals to pull you in and offering you discounts to convince you to buy. The atmosphere is so lively and exciting that I highly recommend at least one visit during your stay abroad. You will definitely leave with some goodies and a happy heart full of memories you will keep forever. A little background, this widely celebrated holiday takes place pre-lent and is publically celebrated with costumes and street parties. People wear masks and dress up, (my host mom told me the most important thing is to not be recognized as your normal self) allowing them to lose their everyday individuality and experience a heightened sense of social unity. And let me tell you, carnaval is a PARTY. 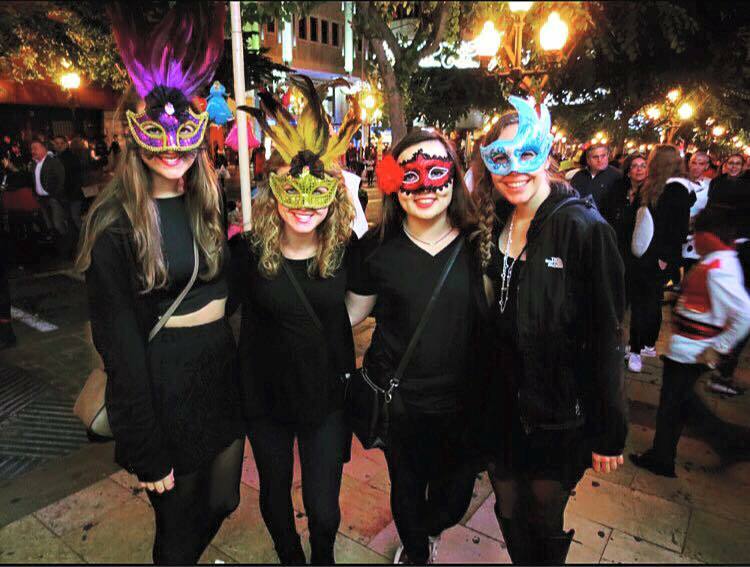 Not wanting to spend much money, a few friends and I bought cheap masks and wore all black. (Disclaimer: If you do this, you WILL be known as a foreigner, so if you want to blend in more dress up more, if you don’t mind having everyone know you’re an extranjero, a mask will do just fine J). Me, Sage, Marshall, and Tori with our masks with La Rambla in the background, where all the main action took place. I wish I had taken more photos, but the people on the streets were all dressed up. Something I found interesting is that it was a common trend to wear the same costume as a group of your friends. There were small packs of Supergirls or Football players walking the streets, which if you think about it is a genius idea because with the streets so packed, it is easier to find your friends. And the streets are PACKED. I have never been to such an insane party just out in the streets. 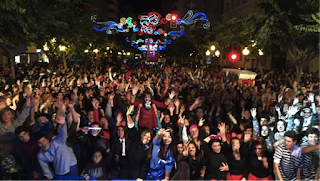 The “rambla” (the central street of the celebrations) was jam packed with people, stages with live music, lights, and vendors. For the large portion of the night, people were in the streets. Later on, they filtered into bars and discotecas. 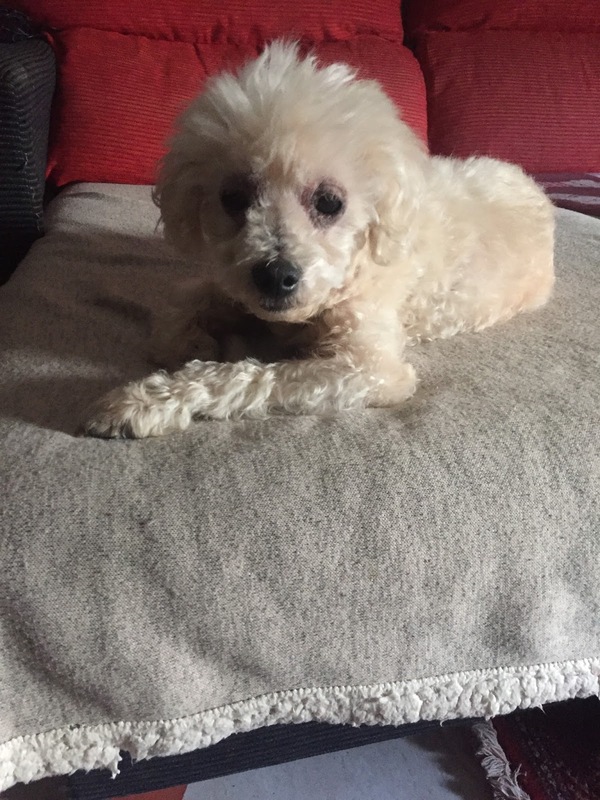 I returned to my apartment at 4am, and was probably the first person to retire for the night. Many people continue to party till dawn! What I really respected about Carnaval though, was that yes, it was a crazy party with plenty of people and alcohol, but things were in safe and secure order. Families were out on the same streets large parts of the evening with children, and as big and crazy as it was, nothing got out of hand. I felt safe the entire night! It was truly an unforgettable experience. 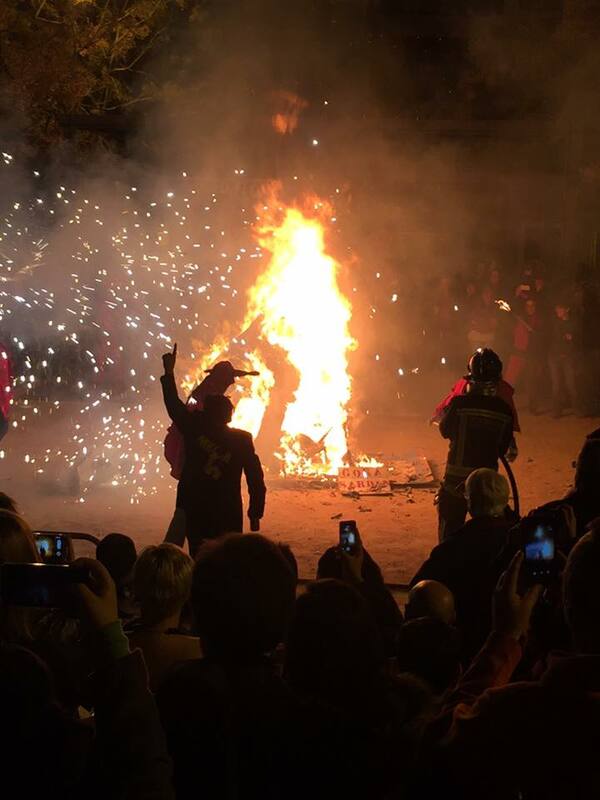 Spain sure does know how to throw a party!! Four days after the main Carnaval celebration, on Ash Wednesday the Entierro de la Sardina is celebrated. This parade celebration, concluded with the burning of a large artificial sardine, is an event that marks the end of the celebration of carnaval, and the beginning of lent. Everyone wears black and jesters dance as the sardine burns. It was a very interesting cultural experience. While this event was much smaller than carnaval, I loved seeing the contrast of the huge party with the settled down start of lent. There is seemingly a holiday everyday here in Alicante, and I wouldn’t trade these experiences for the world. As I sit down to write this I am beyond excited to talk about my host family. I am not sure how it works with all programs, but for me, living with a host family was a requirement. Everyone said it would be the best way to get the most out of my experience, but I was so uneasy about the idea. I would literally have dreams about arriving to the wrong home, not being accepted, or hating my living conditions or having the family not like me. Now nearly a month in I can assure you this statement is true: Living with a host family will enhance your study abroad experience immensely. I might be a little biased, but I feel like I have to have the best host family possible! I have heard this statement from several people in my program, and while I would fight them all to say mine is the best (seriously they're amazing) the fact that I have heard this said so many times shows how truly indescribable it is to live with a host family. Everyone is different, and some people get along better than others, but there is no denying the advantages. First off, you have a place to practice your Spanish freely and without judgement all the time. I promise it is the place you will learn the most! Even if my host brother is arguing about something, he will still pause his argument and turn to me to translate the slang or bad words I didn't understand. Just sitting with them at meals, watching tv, or even talking about my day when I get home from school this is the place I speak and hear the most Spanish and it is invaluable. Secondly, but oh so close to first in importance, is the FOOD. Imagine coming to a new city with a foreign language and being exhausted all the time. Now imagine when you've had a long day and you don't feel like doing anything, a delicious meal has already been made for you. The food here is amazing. I am not a picky eater whatsoever, which works out perfectly for me, but if you let your host family know your preferences they will always take that into account and make sure you are fed more than enough of what you love. From tortilla española to pastas and more, the food keeps coming. In my house I finish what I think was my meal and the "second plate" comes out. I have never left a meal here unsatisfied. Adjusting to the eating schedule can be very trick, as your main course is lunch around 2:30 and dinner can be as late as 10, but just let your host family know if you need snacks or anything. They are there to help! Also prepare to eat more bread than you have in your lifetime combined! Finally, the best part of living with a host family is having people who actually care about you. You will never be sad and alone in an apartment. My host mom Maria and I have done a lot together! She and I have gone for walks around the city, shopped, gone to the movies, and I have even gone to the English classes she teaches and she has helped me study for my Spanish tests. 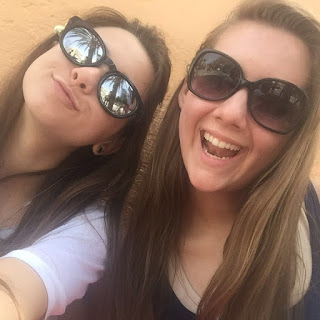 She is seriously my favorite person in Spain! We go back and forth with Spanish and English sayings and pronunciation and I have already learned so much from her. She always asks about my day and whats going on and genuinely cares what my answer is. I am beyond thankful for her! Many host families consist solely of a host mom which in many cases is more than enough! 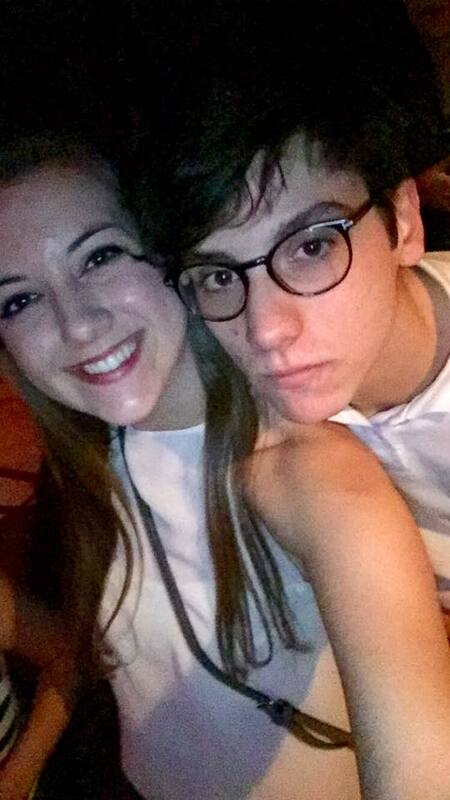 However, I was blessed to have a 19 year old son and 17 year old daughter in my house as well. Having them brings in a whole new aspect of learning. I pick up their slang, they know where the best places in the city are, we help each other with Spanish/English homework, and I have even gone out with my host brother and his friends! It is incredible to have them. I could write forever about my host family and how thankful I am to have them. For now, I just want to reiterate that living with a host family will enhance your experience more than I can describe. Take advantage of the opportunity. You will never be treated so well again in your life! Enjoy it, and make the effort to be social with them, it will pay off!! So if you have read my blog before and seen the background photo, or follow any of my social media you would have seen a gorgeous panorama that I took of the city of Alicante and the sea. If you were wondering where I took a picture of such an amazing view, the answer is el Castillo de Santa Bárbara. Upon arriving to Alicante, and basically everywhere that you walk in the city you will see this castle. It is the most prominently featured part of the city. (And one of the most beautiful). 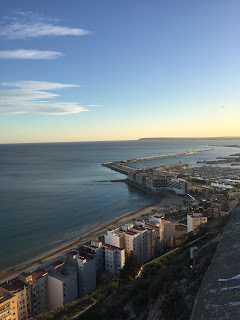 I was fortunate enough to climb to the top of it along with my group from Spanish Studies Abroad just before sunset on one of the first nights I spent in Alicante. The view is indescribable. You can see the port, the sea, the city and the mountains. Pictures do not even do it justice. Clearly I wasn't lying! It made me so excited about the beautiful place I was living. Furthermore, this castle is full of history regarding the city. It was originally constructed by the Moors who invaded the Iberian Peninsula in 711. Ownership went back and forth between the Moors and the Christians for centuries. The most prominent feature of this castle is not the amazing views, but rather, La Cara del Moro, or the face of the Moor that can be clearly seen from several places in the city. There are several legends regarding the face in the mountain, but they all seem to agree that the face belongs to to Moor King who is grieving the loss of his daughter. Regardless of the truth of the legend, there is no denying that a face can be clearly seen in the side of this mountain. My host mom took me on a walk to the point in the city where you can best see it! 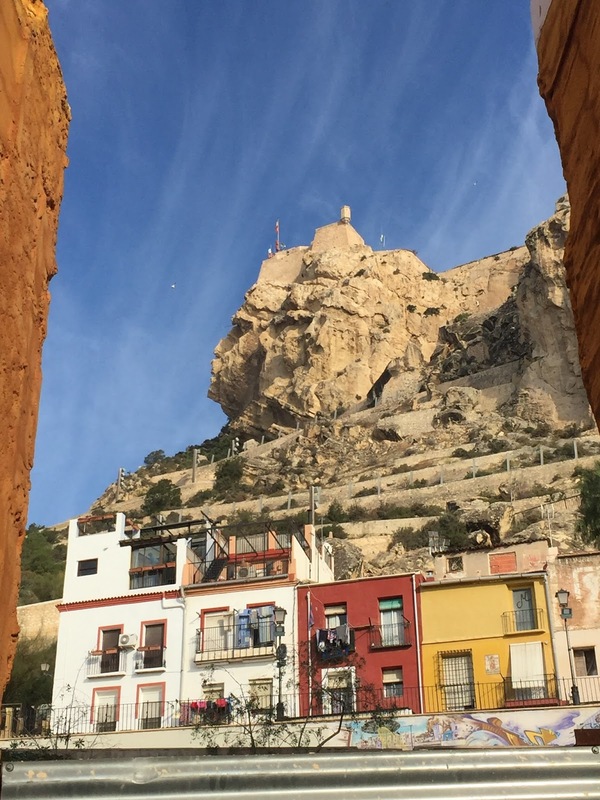 This face and the castle are the real symbol of the city and this should definitely be the first thing you visit upon arrival to Alicante! Anyway, so Friday rolled around and I flew from Boston, to JFK, to Madrid, to Alicante. Traveling was so easy. I followed the same crowd of people almost the whole way. Customs took 30 seconds and I am not even positive the man looked at my face. A breeze compared to the states! I don't know why I was ever nervous! The only part that was nerve racking was arriving to my new home to live with a host family. Watching the taxi driver turn the corner as I stood outside a foreign apartment building with my luggage made my heart drop. I rang the bell and said (in Spanish) "Hi I'm your student, I think I live here" and nearly ran away in embarrassment before she answered "Susanne!!" and buzzed open the door. I was blessed to discover an elevator (as I live on the sixth floor) and was happily greeted by my host mother. She showed me to my room and gave me a quick tour. I could not contain myself when I found out there was a little old dog that lives in the house as well named Fernando or Fer. Within 5 minutes we went grocery shopping. 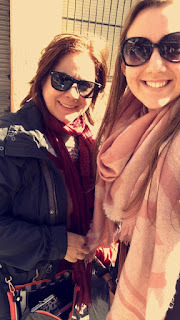 It was so amazing to immediately be surrounded by my city and get to speak Spanish with my host mom who was eager to learn about me, as I was eager to learn about her. She is a wonderful woman who I have already learned so much from in my short time here. I look forward to spending more time with her. She even teaches at the university I attend and we now ride the bus together in the mornings. In regard to my fears, I have been loving every minute of these past few days. Sure, walking into a stranger's home to live there and trying to make new friends, all while trying to speak a new language is very intimidating. However, I wouldn't trade this experience for the world and I am only on day 4. I cannot even imagine how I will feel at the end of all of this! As far as travel and arrival goes, my best advice for future SSA students is to be flexible and open-minded. For me, I was astounded at how nothing turned out how I planned but in a great way! You may have preconceived notions about how Spain or the people will be, but just let yourself be ready for whatever your city has to offer, and get ready for an amazing arrival. Today as I sit down to write this I come to the realization that I will be boarding a plane and embarking on my new adventure in 24 days. I can hardly sit still. I am fully of every emotion you can possibly imagine. As long as I can remember, Spanish has been my favorite subject. I have always wanted to learn more about the language and culture, and especially, TRAVEL. In 24 days, I get the opportunity to do so. The one thing I hope for most is to return with a wealth of knowledge I never could have acquired in the states. I hope to improve my Spanish immensely, and find the confidence to speak it more often and fluently. I hope to see the world in a new light and have my eyes opened to experiences I have only dreamed of until this point in my life. As much as I cannot wait to go, I am surprised by the amount of fear and hesitation I have. 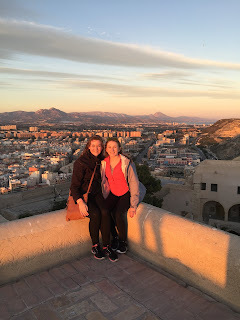 I am nervous to leave the life I have behind, and nervous that I will not be able to make friends in Spain, and that I will be so overwhelmed by the native speakers that I will not be able to communicate. I wonder how I will react to a different world and how I will manage this new experience on my own. I wonder what my favorite memory will be and how many pictures I will take. My questions will begin to be answered in 24 days. My fears will be faced dead on in 24 days. But, more importantly than anything else, I will be living my dream in 24 days.